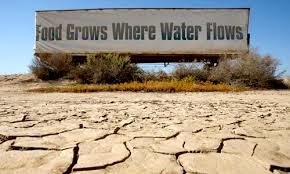 Bluegrass Pundit: Climate Alarmists Heartache: Global Warming isn't behind California's drought. Climate Alarmists Heartache: Global Warming isn't behind California's drought. California's drought is a natural event. Climate change is usually discussed in extremes: Epic heat in Australia. A deadly heat wave in Europe. Hurricane Sandy grinding New York to a halt. The extreme California drought? Maybe not so much. A new National Oceanic and Atmospheric Administration study released Monday shows that the three-year California drought may have been caused by natural variability and not necessarily human-caused climate change. The study follows a series of studies released in September that were inconclusive about the role of climate change in the California drought, and another published last week showing that the drought is the worst the state has seen in 1,200 years. The devastating 3-year drought, which began in 2011 and is ongoing despite recent rains, was caused by a high pressure system that was sitting over the West Coast and part of the North Pacific Ocean, driving moisture away from California, report co-author Richard Seager, a professor of oceanography at the Columbia University Lamont-Doherty Earth Observatory in Palisades, N.Y., said. The persistence of the high pressure ridge was also present in previous long-term droughts in California, some of which were longer than the current drought. The ridge was initially caused by cool sea surface temperatures in the Pacific brought about by a La Niña in 2011, but it persisted even after cool ocean surface temperatures began to warm, the study says.